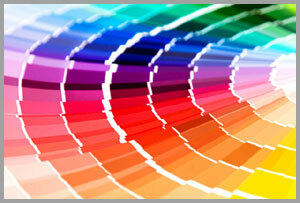 A professional full colour printing service at amazing prices with a full design service also available. A wide range of products can be supplied. If you are looking for some new promotional literature, company stationery or even some large format graphics for an exhibition, we can provide a full design and print service. Whether it be letterheads, business cards, leaflets, brochures, folders - 5 copies or 50,000 - single colour to full colour, you will find our service to be professional, of top quality and competitively priced. Our full colour printing service utilises state-of-the-art litho printing presses, producing jobs to the highest standard. For a small print-run or for personalised/variable data printing, our digital service produces exceptional results for a lower cost. If you just want digital rather than printed documents, we can provide PDF documents of all designs created and can also convert your existing documents. Some sample printing costs are detailed below along with the typical items we are asked to produce. Large format graphics in sizes from A2 to A0 can be supplied as standard with the option of larger sizes as wide as 1524mm and as long as you like, all of which can be printed for both internal or external use. Mounting onto board is also available as an option. Please do not hesitate to Contact Us to see samples of our work or to obtain a quotation.